From Thursday 23 November visitors to The Hub will have an opportunity to see the hidden aspects of the International Festival in the Counterpoint photography exhibition. Created by Beth Chalmers, the 2017 International Festival Photographer, it offers a unique look into the auditoriums and backstage corridors of our venues across the city. Read on to learn more about Beth and some of the special International Festival moments she captured. In August, we could see you popping up with your camera at rehearsals, curtain calls, and everywhere in between. You must have taken thousands of pictures! How did you select them for your upcoming exhibition? Counterpoint is an overview of the International Festival as whole. It is a tricky theme as everything I photographed was so diverse and there were so many shots that I would have loved to share. I started by picking my favourite photos from each art form to make sure all of them were represented well in the exhibition and whittled it down from there. Did you have a specific way of working with different art forms? It definitely is challenging photographing so many art forms. They are all so different and each require specific photographic approaches. For example, when photographing dance, the best shots are over in a split second so you need to be ready to capture that perfect step before it's gone. The most challenging thing for me was capturing the one image that will represent the performance in the press. Conveying an idea of what an audience member might be going to see without giving too much away in one image is no mean feat. If you had to choose your favourite picture from August, one that’s particularly special for you, which one would it be? That's a really tough question. 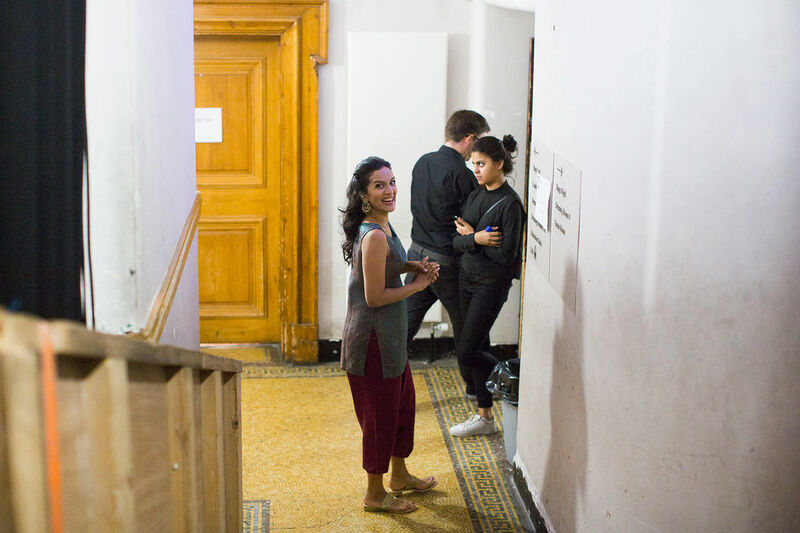 I think my favourite photograph I took is of Anoushka Shankar before she went on stage at the Usher Hall. She's looking at the camera and laughing. The image reminds me of what a privilege it was to meet so many friendly people during August and how incredible it was to be backstage in a venue that I've frequented as an audience member. I think it offers a perspective that few get to experience. And who doesn't smile at a picture of someone else smiling? Can you tell us more about one of those exciting encounters? I bet you have plenty of great anecdotes. I met Jarvis Cocker just as he was about to go on stage to perform Room 29 with Chilly Gonzales at the King’s Theatre. As he walked around the corner, he threw up his hands and shouted 'Don't shoot!' I couldn't really tell if he was serious for a second but then he laughed, so I photographed away. During that shoot he also apologised for being too tall which I really appreciated as my height (or lack of it) doesn't do me any favours when taking portraits. All of this happened in about eight minutes so luckily I didn't have any time to be star-struck. What was it that you enjoyed the most being the Festival Photographer? I really enjoyed the team aspect of working with the International Festival. As a photographer who spends most of the working day shooting and editing alone, it was a welcome change to be part of such a big team, each with diverse and unique skill set. I learned so much about the ins and outs of how the Festival runs and how important each person's role is. I loved the festival spirit in the office - plus there was sometimes cake. I've been so busy since the International Festival closed in August which is excellent. I've been in and out of Scottish Ballet doing some promotional videography, I've been up and down the country with Children's Classic Concerts and their Halloween and autumn shows. I've also been lucky enough to be asked to work with the Traverse Theatre on press shots for upcoming winter performances, so there is plenty on my plate at the moment. Counterpoint exhibition is displayed at The Hub on Castlehill from 23 November. Beth Chalmers is in her early 20s and lives in Glasgow. She studied Music at the University of Glasgow, and on graduation, enrolled in The Glasgow School of Art’s ‘Black and White Photography’ course. She then began working as a photographer part-time, with theatre and the performing arts being the primary focus of her work. The role of International Festival Photographer has since provided the launch pad for her full-time, professional career. Visit Beth's website and follow her on Twitter, Instagram and Facebook to see more great photographs. The Morton Charitable Trust collaborates with the International Festival each year to award an emerging photographer this opportunity. Its generous support ensures this wider view of the International Festival is captured.